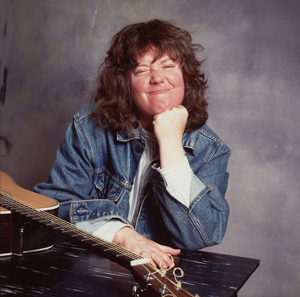 New England singer-songwriter Cheryl Wheeler is a raconteur, philosopher, and outrageous comedienne who combines strong poetry, striking imagery, memorable melodies, and hilariously keen insights into the human condition. With lyrics that walk a fine line between aching poignancy and razor-sharp wit, Cheryl’s long list of powerful originals includes top country hits, "Addicted" (Dan Seals) and "Aces" (Suzy Bogguss). However, her gorgeous voice and sly sense of humor ensure that Cheryl will always be her own best interpreter. As anyone who has caught one of her live shows knows, you have to see Cheryl in person to fully appreciate her genius for steering an entire audience from roof-raising mirth to heart-wrenching empathy and back again, often in the course of a single song. In tonight's concert, Cheryl showcases new selections from her recent CD, Pointing at the Sun, as well as plenty of enduring favorites like "Unworthy," "Gandhi/Buddha," and "Potato." Singer-songwriter Kenny White opens, with tunes from his recent CD, Comfort in the Static.